I'm waiting for Gracie to make me breakfast. Might not happen. Damn dog. Anyhow, I'm good. Started up the latest cycle of maintenance the other day. Not much else to report. 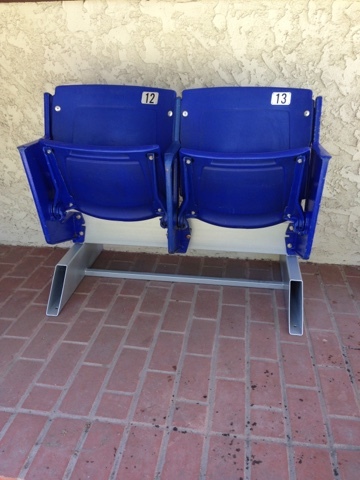 Side note: two years ago I bought two seats from the now demolished Metrodome, where the Vikings played. Seth and I were at the second to last Vikings game in the dome. Leslie's brother made a cool stand for the seats. Check it out. I've seen dozens of games in the old Metrodome. Only one or two Vikings games (against Pack, of course) but a lot of Badgers vs Gophers games, going back almost 20 years. Even saw NCAA basketball Regional games there; Duane Wade on Marquette. Badgers were on other side of the bracket playing Kentucky. They lost that game but won the big one this year!